Google just got its hands on four more Project Glass-based patents this morning. As discovered by Engadget, the U.S. Patent and Trademark Office granted patents this morning that detail the majority of Google Glasses’ right-side. The eye-hovering camera and its inner-workings hidden within the spectacle rim were successfully patented, as well as the nose-bridge sensor, and the function for illustrating sounds in the heads-up display with source, direction, and range details. 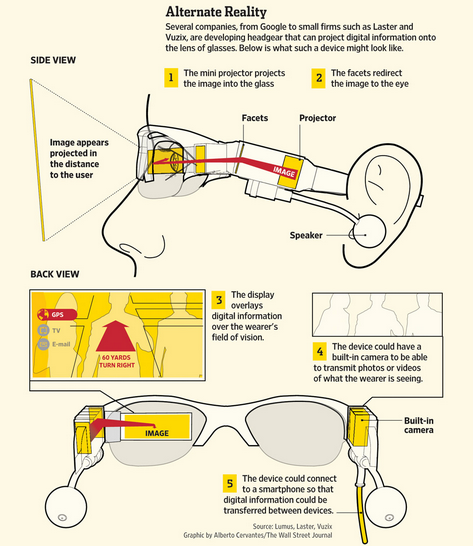 The Mountain View, Calif.-based Company also got the rights to use both eye spectacles as separate displays. The patent’s included example, as shown above, depicts a map visible in one eye with navigation particulars streaming to the other eye. Just last week, patents published by the USPTO showed Google successfully patented at least the ornamental design of its augmented reality glasses that were unveiled last month. The patents show a device that does not look exactly like the prototypes revealed in the concept videos, nor the pair worn by Sergey Brin, but most designs get altered before hitting the stores’ shelves anyway. Meanwhile, in related news, according to the Wall Street Journal, eyeglasses designer Michael Pachleitner Group is jumping on the bandwagon by integrating technology to display information and imagery on to spectacles in its workforce. The Austrian company recently dressed its warehouse employees with $13,000 frames built by Knapp AG. The devices provide visual details through a Wi-Fi connection, so warehouse workers can access over 1.4 million items stored in the facility. The eyewear company hopes to staff all six warehouses by July with employees who will wear the costly apparatus all day. The measure aims to cut “picking errors” by an estimated 60 percent. Knapp began developing the warehouse-picking glasses after buying lenses from Israeli-based optics firm Lumus. The U.S. Air Force apparently provides the same lenses in fighter pilots’ helmets to display details on weapons. The company told WSJ that it is working with “several hardware manufacturers to build consumer devices” around the advanced glass. With today’s Google patents, and competitors bursting at the brim with similar products, it finally seems like augmented reality is no longer a thing of the future, but rather a fact of the present.